This 4-star hotel is located in the business district of Ras al Khaimah, a few minutes from the coast and not far from the majestic tranquillity of the Musandam Mountains. Bin Majid Acacia Hotel boasts fantastic facilities, with an outdoor pool to relax in, plus an Oxygen gym and O-Zone Spa available. 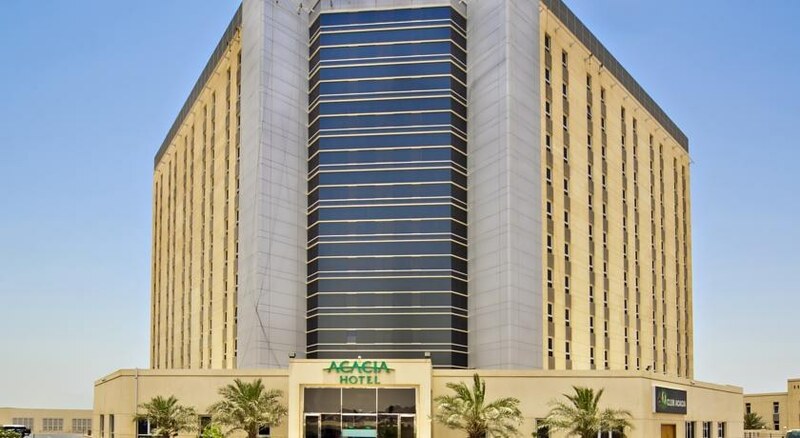 The 373 rooms at Bin Majid Acacia Hotel are well-presented for business travellers, as well as families, friends and couples, with a choice of room size and view available. The dining options are aplenty, with five restaurants and bars serving a mixture of Arabic, Mediterranean and Far Eastern cuisines, plus themed nights on offer. Explore the great outdoors and go hiking with a stunning mountainous backdrop, or take on a 60-minute drive to the exciting city centre of Dubai. 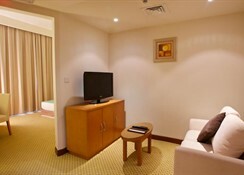 Bin Majid Acacia Hotel is located adjacent to the Ras al Khaimah Free Zone, and minutes from the gorgeous coast. The hotel has plenty of entertainment in-house, but since it’s situated in the business district, you won’t find bundles of attractions at walking distance. However, the exciting city of Dubai is a 60-minute journey by car, if you do fancy a change of pace. 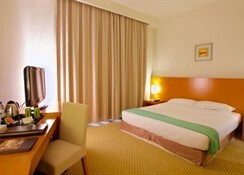 The hotel’s 373 stylish rooms are suitable whether you’re travelling on business, with family or friends. Offering comfort and relaxation, guests can choose between a One Bedroom Apartment, Standard Room, Standard Pool View Room, One Bedroom Suite and Junior Suite. All rooms are equipped with modern conveniences including a living area and kitchenette, or you can request connecting family rooms if so required. 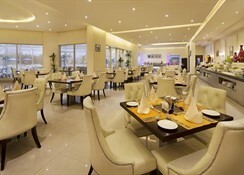 The Al Nakhla Restaurant is the hotel’s all-day buffet-style restaurant, which serves international cuisine suitable for breakfast, lunch and dinner. In addition to this, there is the Garden Brew Café, Tides Pool Bar and Flamingo Lobby Bar serving refreshments throughout the day with a laid-back ambience. In the evening, Club Acacia offers entertainment with live music from the resident DJ – a great way to unwind without leaving the resort. Make the most of the resort’s facilities during your stay, with a swimming pool, O-Zone Spa and Oxygen Gym to enjoy. If you want to stay active, the gym or the pool is the place to be, while those after R&R can visit the hotel spa. You’ll find a variety of relaxing treatments on offer, including massage parlours, a spa bath and face and body therapies.